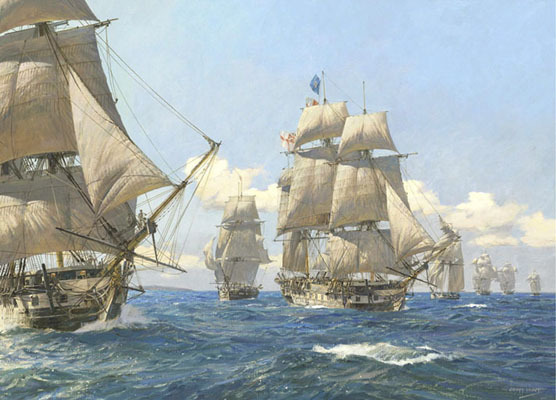 CS Forester's series of eleven novels about the career of an officer in the Royal Navy at the time of the Napoleonic Wars is one of the greatest works in the genre of historical fiction in the English language. 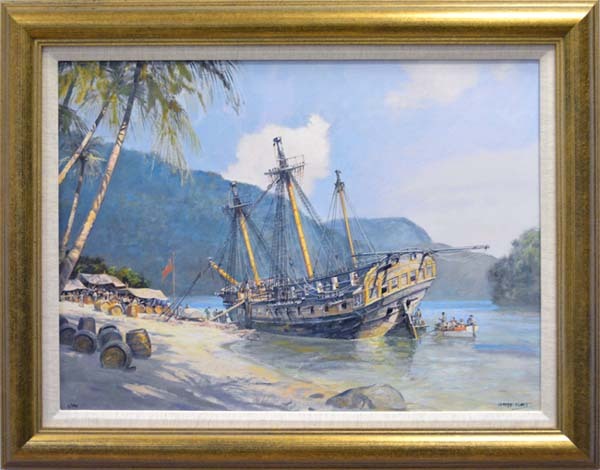 Geoff Hunt has created a series of paintings inspired by the Hornblower stories, each image being published by Art Marine as a limited edition print, both on paper and on canvas. Horatio Hornblower's first appearance in Forester's books is as a seasick midshipman. As the Napoleonic Wars progress, he gains promotion steadily, despite his initial poverty and lack of influential friends, as a result of his skill and daring. Eventually, after surviving many adventures in a wide variety of locales, he rises to the pinnacle of his profession, promoted to Admiral of the Fleet, knighted as a Knight Grand Cross of the Order of the Bath, and named the 1st Baron Hornblower. "Pacific Haven" on canvas, stretched and framed with a canvas slip.